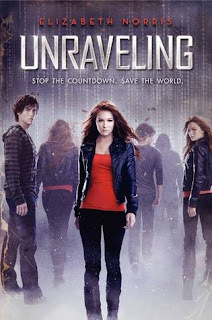 If you like suspense, mystery, sci-fi, and a fast-paced plot, you're going to enjoy Unraveling, by Elizabeth Norris. We had the chance to interview this debut author over Skype as part of our debut author series of podcasts and The Story Siren's Debut Author Challenge. Elizabeth has an incredibly inspiring story about becoming a published author (she won over superstar agent, Janet Reid, aka the Query Shark! ), so aspiring writers, be sure you don't miss this episode of the podcast. Published by Balzer + Bray, an imprint of HarperCollins, Unraveling hits bookstore shelves today. Happy book birthday to Elizabeth! Visit Elizabeth Norris at her blog, and check out Janet Reid's Query Shark blog. Also: special announcement for Southern California listeners! We're going to be moderating the YA or Bust! panel at the Huntington Beach Barnes and Noble tonight, April 24th, featuring Stephanie Perkins, Gayle Forman, and Nina LaCour. We're so excited, and we hope to see you there! Oh my goodness YAY! I REALLY want to read this book! So cool! Love the Podcasts! Keep it up! Awesome podcast. Can't wait to read this book! I have heard amazing things about this book! Cannot wait to start reading my copy. And I love the podcast.